Try saying that title three times fast! 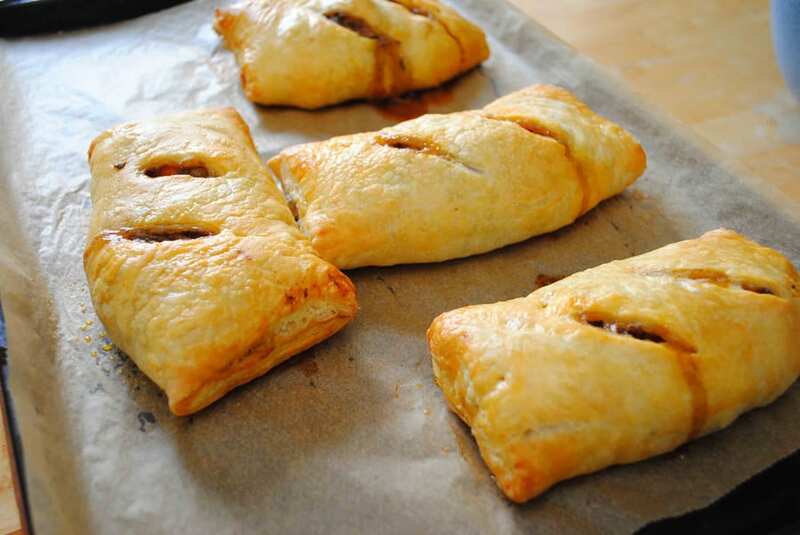 Puff Pastry Pasty’s are so delicious, especially on a cold winter day. 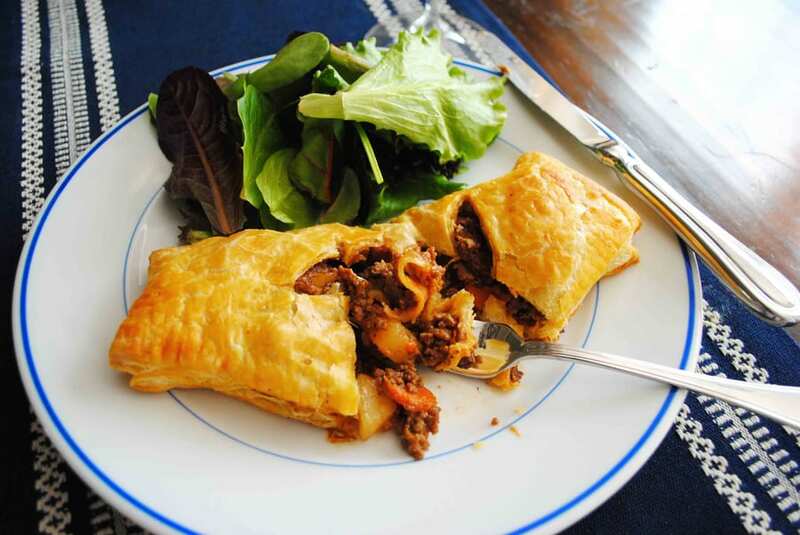 The meat and vegetable filling is cooked with a little gravy and then rolled into a flaky puff pastry that cooks up golden and delicious in the oven. It just doesn’t get much better. 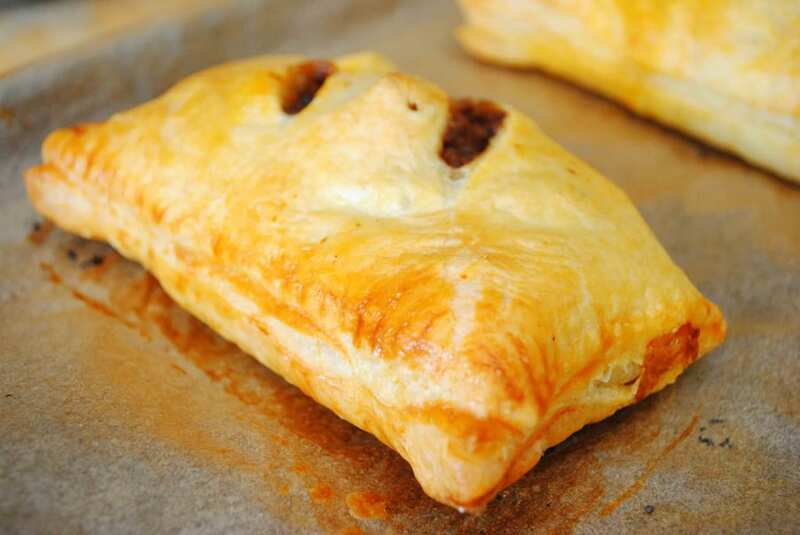 Unlike most traditional meat pies I love pasty’s because they are individual hand pies, making everyone feel special for getting their very own. One of my closest friends is from Michigan, the UP to be exact. She gave me a Yooper cookbook about ten years ago and requested I make things from it. A recipe for pasty’s was in there and I was intrigued. I had never heard of a pasty before. As soon as I would mention pasty to anyone else from Michigan I was met with grunts of affection. Not that people in Michigan grunt and don’t speak, but I began to realize pasty’s are the ultimate comfort food that someone makes you to share their love and affection with you. It takes time to make them, although it’s not at all difficult. 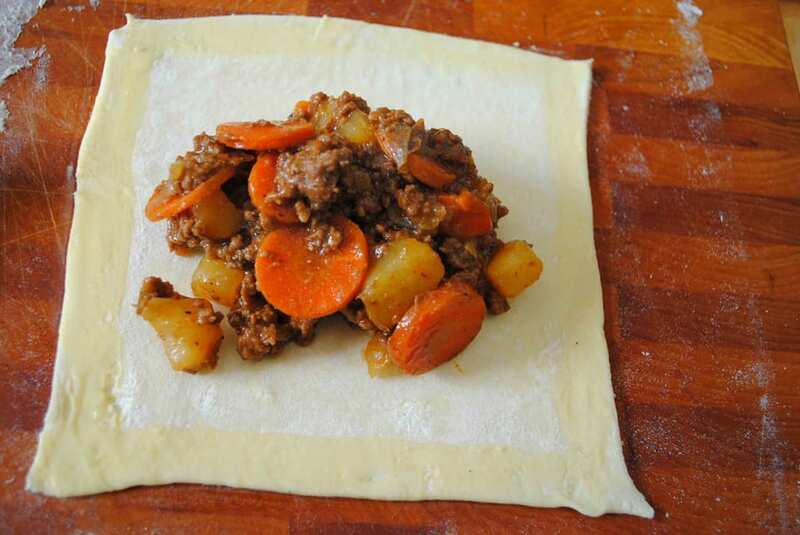 Traditionally pasty’s are made with more of a pie crust. I’ve made them before this way and they are great, but I really felt like the addition of puff pastry just elevated them up a notch. I was even more excited to find that I could make the Puff Pastry Pasty’s and freeze them! They were just as delicious after reheating, and incredibly crispy and flaky still. Being able to make them ahead on a weekend and keep them frozen is incredible and makes them really easy to do for company or pull out during a busy weeknight. Below the recipe I’ll show pictures of the steps to making them. Heat oil in a large dutch oven or pot over medium heat. Add in the carrot, onion, and potato with 1 tsp salt. Let this cook and soften about 8 minutes. Stirring occasionally. Add in garlic, tomato paste, thyme and oregano. Mix well. Add in meat and brown. 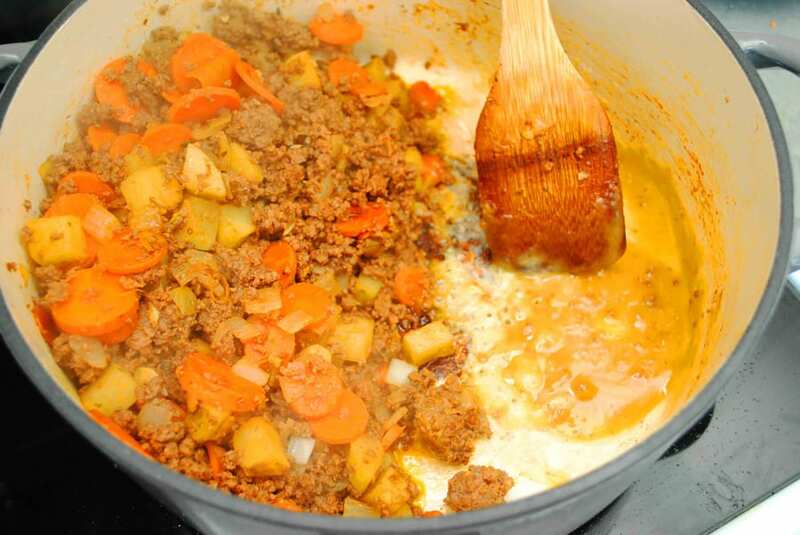 Once meat is brown and everything is mixed up push everything to one side of the pot. On the empty side add in the butter and flour and mix well until the butter is completely melted and the flour has turned a light brown color. Add in the soy sauce, pepper, and stock and stir together with the meat mixture. Allow this to all simmer for about 5-7 minutes. When a spoon is scraped along the bottom you want the liquid to be thick and gravy like and not pool into the pathway of the spoon. Allow to cool for at least 30 minutes before filling the dough. Mix 1 egg with 1 tbsp water. This is your egg wash.
Preheat an oven to 400 degress. Cut each sheet of puff pastry into 4 squares. 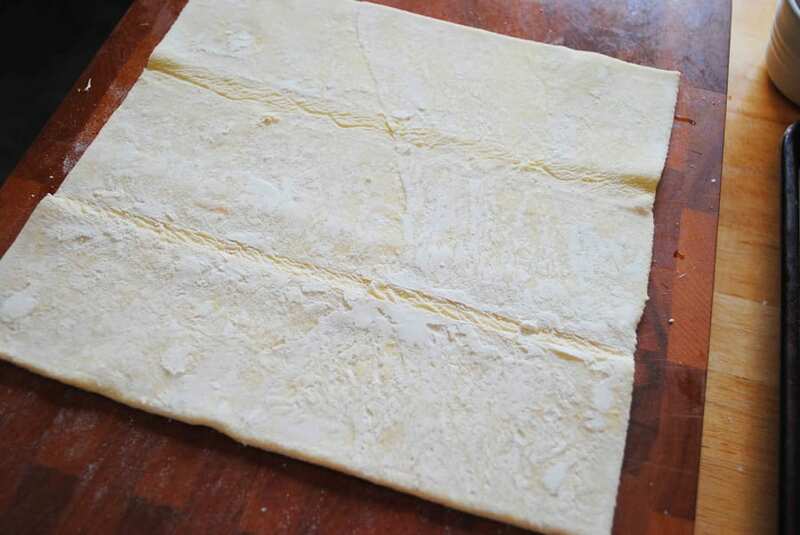 Carefully roll each square (adding a little flour to the board and rolling pin) to a 8" by 8" square. Place 1/2 C meat filling into the middle of each spare. Brush the square with egg wash around the sides and fold in half. Then using a fork press it into the edges to seal the meat inside. Move the pasty to a parchment lined baking sheet. Brush each all over with egg wash and then put two diagonal lines in the top to allow steam to escape. Once all 8 pasty's are done ( I used two sheet pans to hold all 8) place them in the oven and allow to bake for 30 minutes. **If freezing, then bake and allow to cool. Wrap each in parchment paper and then stack them in a large zip lock bag. Place in freezer. 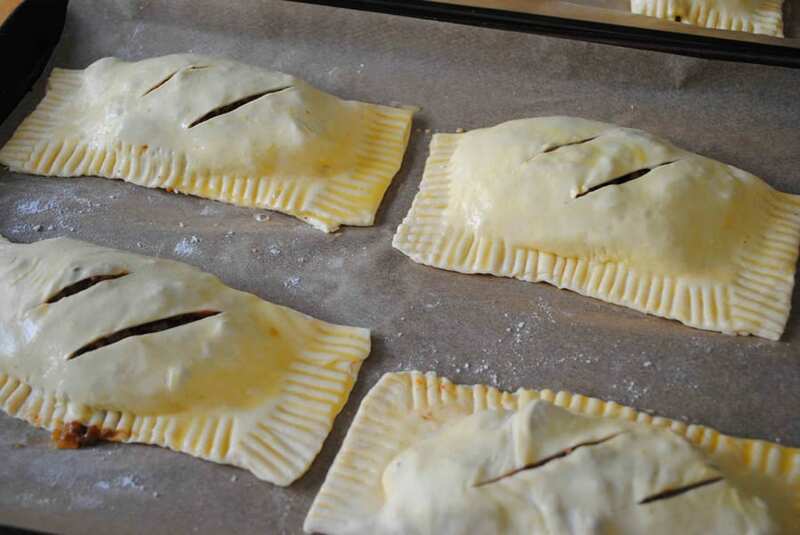 When ready to use then pull them out, unwrap them and place the pasty's onto a parchment lined sheet pan and reheat in a 350 degree oven for 25-30 minutes. Until the outside is flaky again, and the inside is very warm. Push all the meat to the side of the pot so you can make the gravy on the other side. Test with a wooden spoon to make sure your meat mixture is thick. 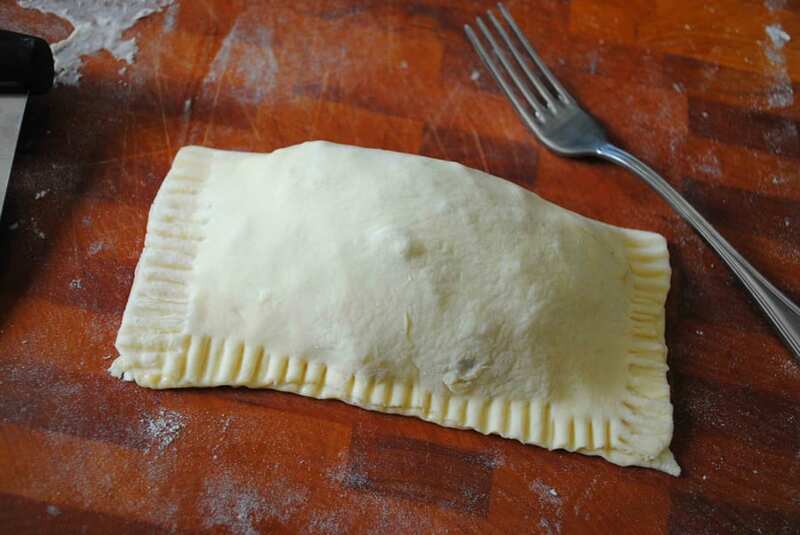 Cut the puff pastry into four equal size squares. Put a 1/2 C of meat mixture in the center of each square and brush the edges lightly with egg wash. 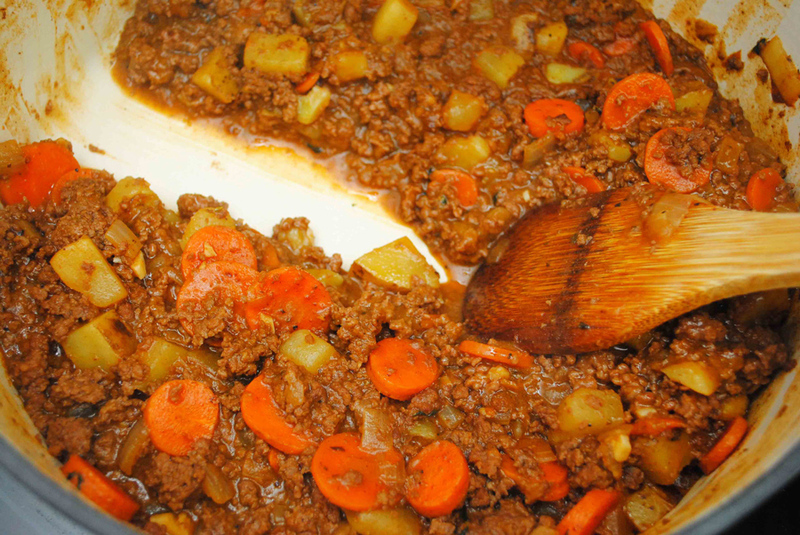 Fold over and crimp the edges with a fork to seal the meat mixture inside. Place on a parchment lined baking sheet, brush with egg wash and then slice to diagonal lines on top to allow steam to escape. I wish I could send them to you! 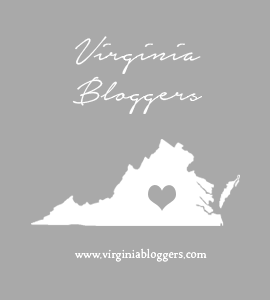 Stay warm and thanks for the pin Susan! looks and sounds so hearty and delicious! These look so perfect for the still chilly days! Warm and filling! Thanks Kari! They are so good for winter days! My husband would be all over these! Haha! Mine loves them Shelby.